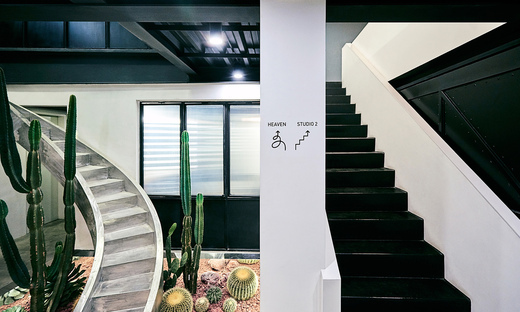 The designers from Chinese firm United Units Architects (UUA) have completed the architectural project of ASTUDIO, the photography studio founded in Beijing by renowned photographer Li Xiaoliang and his team. 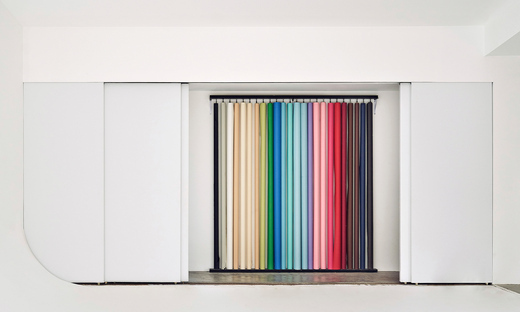 The designers from Chinese firm United Units Architects (UUA) have completed the architectural project of ASTUDIO, the photography studio founded in Beijing by renowned photographer Li Xiaoliang and his team. A benchmark for interior design intended for the world of photographers. When you think about it, it's quite strange that we don't discuss them more often but apparently, photography studios mustn't be particularly photogenic because you won't find that many at all on the web. Although we're all well aware of the crucial role played by the image created by a professional to communicate a given architectural project, we don't really know much about the relationship between the photographer and the architect when the client is actually the photographer themselves. 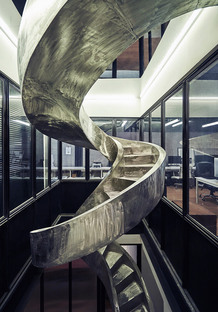 This makes the project by UUA - which stands for United Units Architects and has offices in London and Beijing - for the renowned Chinese photographer Li Xiaoliang, founder of ASTUDIO all the more interesting, and we can also enjoy the shots that the photographer himself took of his workplace. The first thing the architects did was to study the existing building situated at the east end of Beijing's central business district in the Art Valley Cultural & Creative Industry Park. 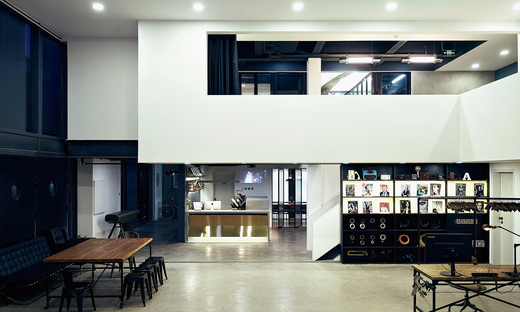 They decided to transform the interiors of the new ASTUDIO office space by giving it an industrial style with minimalist overtones and turning the original two-storey building into a three-storey space. They also did this to meet the needs of the photographer who wanted to be able to carry out simultaneous and independent shooting, which necessitated separate photography studios. UUA did all of this without changing the existing building envelope. 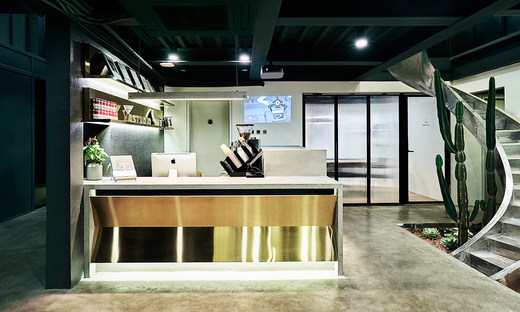 They simply revamped the interiors to integrate designated areas for photo shooting, dressing, reception, meeting, working, and leisure. 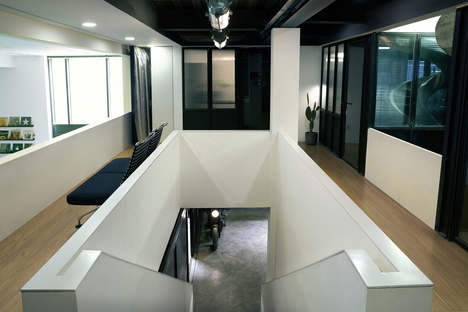 The UUA concept was to retain half of the first floor double height space for Studio 1 and to add a new second floor to the remaining half to accommodate the reception area and a flexible working space. They then situated Studio 2 on the top floor of the building. The architects went for a fine quality colour palette and materials, which, even more importantly, would optimise the photography environment. So they combined black, white and grey, and added pops of a brass metal colour in specific areas. The texture and colour of the original brickwork of the walls were preserved by giving it a clear coating, in contrast with the ceiling that was painted black. The public floor area has been covered with self-levelling concrete, while the workspace and dressing room areas have timber floors. UUA worked very closely with the photographer Li Xiaoliang and the artist Li Wei throughout the whole design and construction process to create a series of art installations that give the whole space a particularly artistic feel. 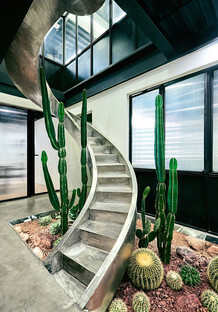 This close collaboration between photographer, artist and architect produced ASTUDIO, a workplace that sets a benchmark for creativity and imagination as well as being tangible proof that photography studios can also stand out visually, regardless of the photos that are produced there.